SPORTS minister, Kirsty Coventry, yesterday regretted the chaotic scenes at the National Sports Stadium where a stampede claimed one life on Sunday. A woman identified as Egna Nyamadzawo died as she made her way into the giant stadium in the company of her husband. 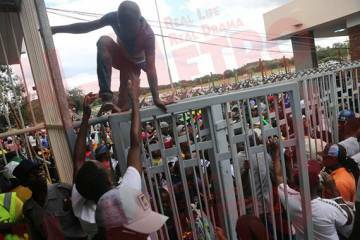 Impatient fans brought down Gate 3 and Egna was a victim of the ensuing stampede as kick off to the Zimbabwe versus Congo-Brazzaville match approached. There were others who were injured amid the chaotic scenes. Yesterday Minister Coventry took to Twitter to express her sadness and call on stakeholders to be better prepared. Zimbabwe Football Association (ZIFA) also expressed heartfelt condolences to a fan who passed on. Football fanatics have expressed dismay over the stampede which occurred at the National Sports Stadium on Sunday resulting in the death of a fan. Several stakeholders took to social media expressing their feelings while many played the blame game pointing at the country’s football mother body – Zimbabwe Football Association – while others blamed supporters as being responsible for the mayhem. Kwanele Matiwaza‏ @kmatiwaza: It’s all about event planning and making sure there is enough resources to manage the crowd. Pinch points result in stampede. Set up a Safety Advisory Group involving all stakeholders, emergency services, police and event security companies. Brand_hk‏ @BHAKUREKWI: Extremely poor planning, it’s unacceptable of the organisers. This should be done months in advance and will take several drills to get it right. TavongaG‏ @TNumber003: Officials have to realise some people go to the game with every intention to get in for free by causing some kind of fracas. It’s so sad, why do we have to go through this always? What kind of organization is this? We should be better prepared this is very embarrassing. 🇿🇼‏ @nematombo: Can I suggest you look into creating ”Stadium Management” Company that has a similar role as National Handling Company at the Airport? I had experience with a similar company last year for a soccer match we hosted at FNB Stadium. If you need pointers, I can assist. GP🇿🇲‏ @Gerva80: Your gatekeepers are so slow, most of your gates will be closed/locked for such a big game shame poor management. Earl Mapani‏ @mapearle: it’s because they want to have limited gates open and deliberately create a bottleneck. Football fans are already frenzied, don’t contain them, and just channel them. Mdara hre‏ @HreClean: Problem is we do not like hiring safety professionals to sort these kind of things some of us a busy practising out of the country because our own country will not hire us. Farmer Admiro‏ @ADzirutwe: They wait for people to pile up at the gate then open knowing what will happen. NoLoveLost‏ @Mukoma: That’s your responsibility as a ministry. Things need special attention to avoid this kind eventuality. Mervyn kadaash‏ @MervynMacool: Personally #ZIFA, @KirstyCoventry Have failed us the blame of these events are in your hands we bought tickets before yesterday. But what did you do to make sure people entered the ground swiftly. okaoka78‏ @okaoka78: The problem is us supporters not organizers nor security, we come early to the stadium and wait till late to force entry, thus hooliganism. Joe Hombarume‏ @Zim_we_want: You can blame organisers all you want but sometimes people must take responsibility for their actions. McDonald Ziwaya @ McDee1981: Inasmuch as ZIFA is to blame we are also to blame. ZIFA had said gates will be closed at 1330hrs, in our wisdom or lack of it we still got to the stadium at 1430 hours. I applaud the association for trying out pre match ticket sales. We also had to play our part.